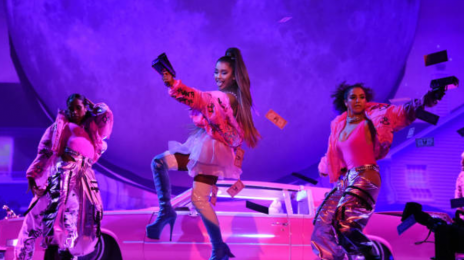 As of time reported, Ariana Grande‘s latest song, ‘7 Rings,’ may be sitting atop the iTunes sales charts (and has been so since its January 18th release), but the soon-to-be hit has also been sitting atop the hitlist of a number of detractors who claim the tune is drenched in uncredited and – at times – inappropriate cultural references. I’m not a fan Thank you, NEXT!! Weave isn’t the issue I had. All races wear weaves/wigs and at a large rate and it’s not a new trend. I wish the black community would have focused on the more concerning issues more black specific like it being a trap house..
SHE aint got nothing on TROLLmine’s hair pieces. 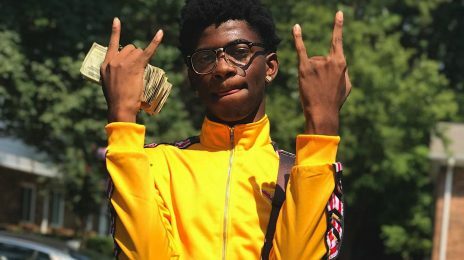 TROLLmine got that Virgin Remy extra long yacky yacky Shaniqua #2. Imma have to steal it from her and sow it in my nappy head so I can catch some TRADE. TROLLmine got the hook up. Imma sow in my weave, tuck real good, and catch me some straight trade tonight. I’ll just tell him I got stomach cramps and he can hit from the back. YEAH FOR SURE. ppl find anything and i mean anything to complain about. if i was a celeb yall would just be mad at me cuz i wouldn’t apologize just because yall get mad at stuff. beyonce is very smart to not engage in social media cuz anything she may post is up for scrutiny. glad rihanna started using hers for advertising her business ventures. now i just need cardi to follow suit. Wait…did I just read that if you tan to get draker then you’re appropriating the black community?! Lord, help me! Jesus! I just cannot with this s*** anymore. I am so thankful for my intelligence, openness, and common sense. The question is WHY she wants to tan darker than Drake and why she suddenly started using that accent. Exactly. If you’re tanning to the point where you’re darker than actual black people, you’re walking around in brown face. There’s this picture of her standing next to Nicki Minaj and they are the SAME color. How do these stans not see that as a problem? At one point white people were just tanning to tone the skin and warm it up from being so pale. 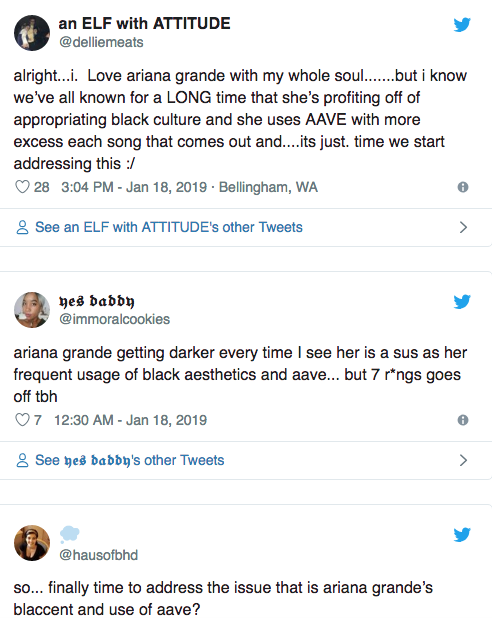 Now, they’re all doing it to the extreme to achieve this racially ambiguous persona and they almost ALWAYS do it in combination with black slang and black music. 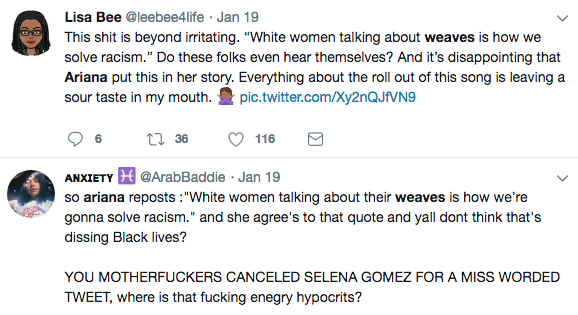 “White women talking about weaves is how we’re gonna solve racism” was such a stupid thing to repost. It was an insensitive comment. Why would she do that, especially considering the heat she was already in?? 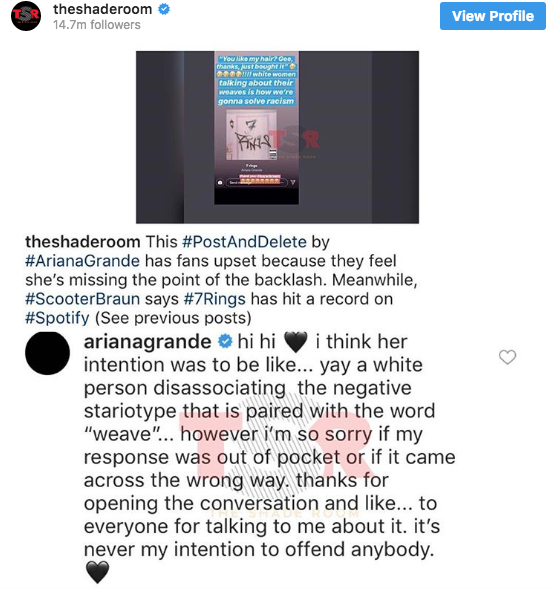 She was just asking to be dragged this time. Who ever thinks that she is black? 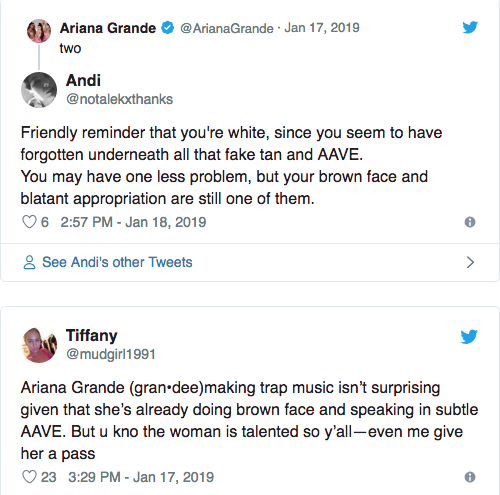 She is called Ariana Grande – she is Italian, the f*** – so if she is something, then maybe kind of Hispanic. While she is tanning obviously, skin tones are changing through the years. I‘m not as white as I used to be when I was 16 either. And all of a sudden white women aren’t allowed to buy weaves? Black people should stop doing ballet. This is a cultural appropriation. 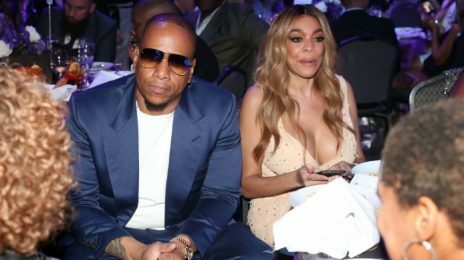 They should stop using straight wigs as well. No no that argument is valid! If the black community want to take things to an extreme we can use that as well. Tbh I pass on all that cultural appropriation stuff that’s a think invented by over sensitive millennials with too much free time on their hands. 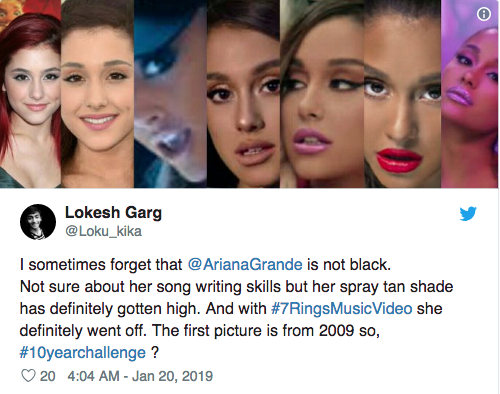 I see no problem when a white woman bronzes herself and when a black woman uses products to white their skin just let everyone use what they like. F*** all this cultural appropriation s***! She’s a pop diva of course she wear wigs and weaves… TF? lol f****** black people. ya’ll are hilarious. She needs to tell them to STFU. They’re reaching. People need to get a life everyone wear weaves, it is not for us blacks only.